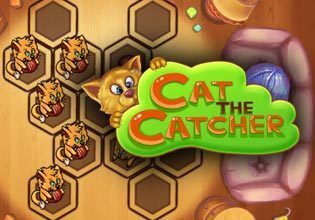 Cat the Catcher is a fun puzzle where your goal is to help the little cat get its string ball in order to play with it. Only the string ball can be moved though, and sometimes there are more than 1 ball and 1 cat in a stage so you have to plan your moves accordingly, you need to move all the balls in the same direction so all the cats get their string balls. Sometimes this will seem tricky and through out the many levels more than puzzle will give you a headache to resolve but that's the fun!